A wild day in the life of the Perky Jerky mascot, Jerk Man! Perky Jerky came to us with an immediate need to produce a 360 video for virtual reality, to be displayed in Oculus DK2 and Samsung Gear VR at the Snacks and Sweets Show in Chicago, one of the largest trade shows in the snack industry. The biggest concern was the turnaround time, the show was started on May 18 and we only heard about the project with less than 2 weeks notice. Nonetheless, we accepted the challenge! One might think that a project about jerky is really not that exciting, but with the Perky Jerky team this couldn’t be any further from the truth. 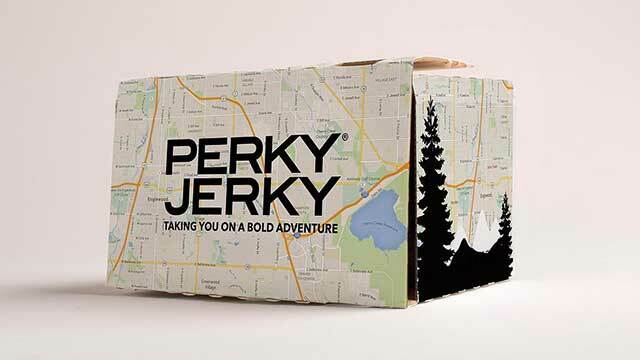 They had a whole plan mapped out for a day in the life of Jerk Man, the Perky Jerky mascot. 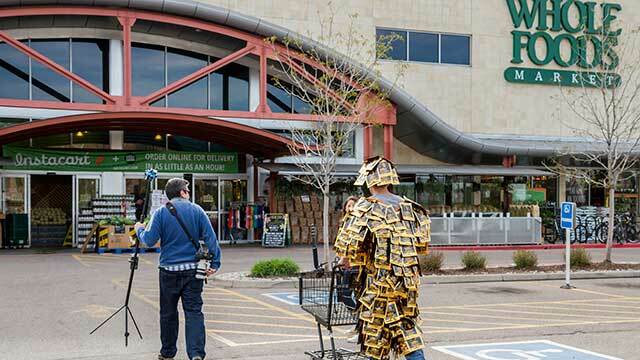 Donned in a suit of silver or gold Perky Jerky bags, he looks like some form of ancient Samurai. The day’s activities would include flying the Perky Jerky blimp at dawn, stocking up on more jerky supply at a local Whole Foods, visiting Colorado’s famous Red Rocks Amphitheater, floating in a 220 mph wind tunnel and ending the day off with a celebratory Jägerbomb. It might seem silly, but the story behind Perky Jerky is quite emotional. Jerk Man was made famous by CEO Brian Levin when he ran the NYC Marathon in the suit made up of nearly 45lbs of Perky Jerky sample bags in an effort to raise funds for Duchenne Muscular Dystrophy and Down Syndrome research. Levin’s own son, Jake, was diagnosed with Duchenne at age 3. His other son, Sam, has Down Syndrome. Perky Jerky donates a portion of all of it’s earnings to Duchenne Muscular Dystrophy and Down Syndrome research. It’s very inspiring to see a dad make a huge difference through his business, and we at 360 Labs were honored to be able to work for a client with such great core values. Compatibility was a big issue back in May of 2015, YouTube support was limited and bandwidth on the tradeshow floor was nonexistent. Facebook hadn’t even enabled 360 video content yet. For these reasons, we had to recommend they run a local copy of the video on mobile devices and the desktops connected to Oculus headsets. We made several bit rates and resolutions available to suit all circumstances, and made our team available 24/7 to answer questions during the show for support. Dodocase also came through in record time with a shipment of custom Google Cardboard viewers for Perky Jerky to give away to VIP guests. Ever since they pledged to help our documentary project, As It Is, they’ve been an incredible partner to us. They never fail to impress. Despite the last minute effort and the risk, the show went off without a hitch. “The video was an absolute hit at the trade show, we rocked people’s worlds and saw so many heads bobbing, it was amazing!! Congrats to you guys for some amazing shooting and editing,” said Levin. 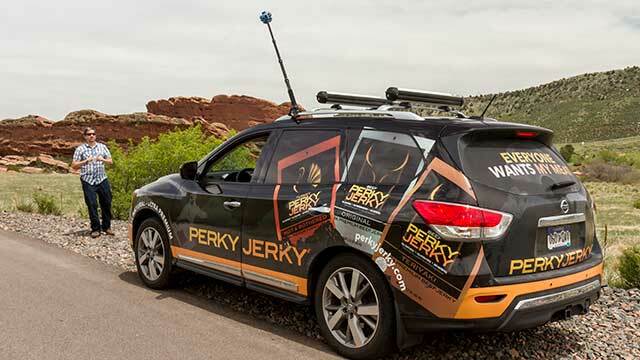 We salute Perky Jerky for being an early adopter of virtual reality and 360 video technology. It takes guts to put together a project like this with so many unknown factors, as pioneers they created lasting memories of their brand at a major trade show. Doesn’t get much better than that! "The video was an absolute hit at the trade show, we rocked people’s worlds and saw so many heads bobbing, it was amazing!!"